Cervantes is a town in Western Australia off Indian Ocean Drive about 198km north-north-west of the state capital, Perth in the Shire of Dandaragan local government area. Kick off your visit on the 8th (Mon): take some stellar pictures from Thirsty Point Lookout. Get ready for a full day of sightseeing on the 9th (Tue): explore the striking landscape of Badgingarra National Park. To find out how to plan a trip to Cervantes, use our trip itinerary maker. Sydney to Cervantes is an approximately 13-hour combination of flight and bus. You can also drive; or do a combination of bus and train. The time zone changes from Australian Eastern Standard Time (New South Wales) to Australian Western Standard Time, which is usually a -2 hour difference. On the 10th (Wed), wrap the sightseeing up by early afternoon so you can drive to Perth. 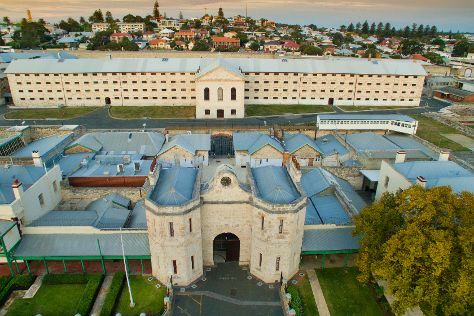 Let the collections at Fremantle Prison and Aspects of Kings Park capture your imagination. Kids will appreciate attractions like Rockingham Beach and Point Peron. And it doesn't end there: identify plant and animal life at Matilda Bay Reserve, examine the collection at Aviation Heritage Museum, don't miss a visit to Monument Hill War Memorial, and take in the spiritual surroundings of St. George's Cathedral. To see where to stay, traveler tips, reviews, and other tourist information, refer to the Perth online holiday planner . Getting from Cervantes to Perth by car takes about 2.5 hours. Other options: take a bus. In July in Perth, expect temperatures between 21°C during the day and 8°C at night. You'll have a few hours on the 14th (Sun) to wrap things up before traveling to Bunbury. Family-friendly places like Logue Brook Dam and Hungry Hollow Beach will thrill your kids. You'll explore the less-touristy side of things at Featured Wood Gallery & Museum and Wellington National Park. And it doesn't end there: kick back and relax at Wyalup-Rocky Point, look for all kinds of wild species at Crooked Brook Forest, and look for gifts at Eaton Fair Shopping Centre. To find other places to visit, reviews, more things to do, and more tourist information, you can read our Bunbury journey maker app . Drive from Perth to Bunbury in 2 hours. Alternatively, you can take a train; or take a bus. Finish your sightseeing early on the 17th (Wed) so you can drive to Albany. On the 18th (Thu), see majestic marine mammals with a dolphin and whale watching tour. To see where to stay, photos, ratings, and tourist information, use the Albany day trip site . You can drive from Bunbury to Albany in 4.5 hours. Other options are to do a combination of bus and flight; or take a bus. July in Albany sees daily highs of 19°C and lows of 7°C at night. Finish your sightseeing early on the 19th (Fri) to allow enough time to drive to Busselton. Kick off your visit on the 19th (Fri): look for all kinds of wild species at Wildlife Areas and then take an in-depth tour of Busselton Museum. To see ratings, other places to visit, photos, and more tourist information, use the Busselton travel route planner . Drive from Albany to Busselton in 4.5 hours. Alternatively, you can do a combination of flight and bus; or take a bus. On the 20th (Sat), you'll travel back home.